#1 - 4.78 - Josh Thomson vs. Gilbert Melendez (Strikeforce: Evolution) . #2 - 4.67 - Fedor Emelianenko vs. Brett Rogers (Strikeforce: Fedor vs Rogers) . #3 - 4.59 - Carlos Condit vs. Martin Kampmann (Fight Night 18) . #4 - 4.53 - Mike Brown vs. Urijah Faber (WEC 41) . #5 - 4.51 - Mike Thomas Brown vs. Jose Aldo (WEC 44) . #6 - 4.51 - Miguel Torres vs. Takeya Mizugaki (WEC 40) . 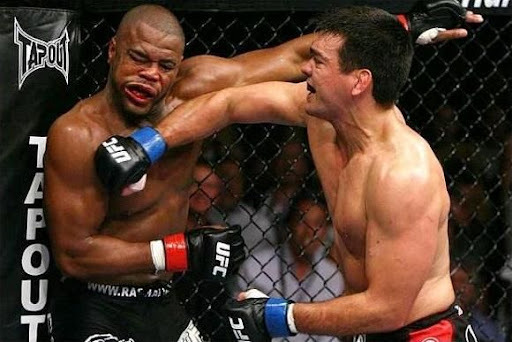 #7 - 4.43 - Lyoto Machida vs. Rashad Evans (UFC 98) . #8 - 4.39 - Joachim Hansen vs. Shinya Aoki (Dream 11) . #9 - 4.38 - Bibiano Fernandes vs. Hiroyuki Takaya (Dream 11) . 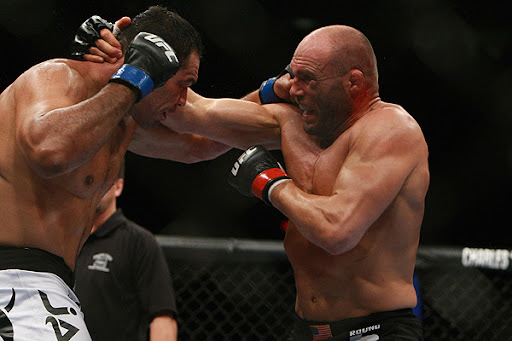 #10 - 4.35 - Randy Couture vs. Antonio Rodrigo Nogueira (UFC 102) . Fight Rankings are user generated based on fight ratings. Publish them on your site. Brian Bowles vs. Miguel Torres (WEC 42) enter the 2009 Top 10 Fight Rankings at #7 with an average rating of 4.27 stars. Georges St. Pierre vs. B.J. Penn (UFC 94) falls of the top 10. Randy Couture vs. Antonio Rodrigo Nogueira (UFC 102) enters the 2009 Fight Rankings at #6 with 4.33 stars. Diego Sanchez vs. Clay Guida (Ultimate Fighter 9 Finale) falls off the top 10. At #5 WEC 43's Donald Cerrone vs. Benson Henderson. enters with 4.47 stars. This is followed by Dream 11's Bibiano Fernandes vs. Hiroyuki Takaya. at #6 with 4.38 stars and Joachim Hansen vs. Shinya Aoki. at #7 with 4.33 stars. Brian Bowles vs. Miguel Torres, and ironically WEC 38's Jamie Varner vs. Donald Cerrone. Josh Thomson vs. Gilbert Melendez (Strikeforce: Evolution) enters the rankings at #1 with 4.78 stars. Fedor Emelianenko vs. Brett Rogers (Strikeforce: Fedor vs Rogers) enters the rankings at #2 with 4.67 stars. Lyoto Machida vs. Rashad Evans (UFC 98) hangs on at #3 going from 4.58 stars to 4.6 stars. Carlos Condit vs. Martin Kampmann (Fight Night 18) drops from #1 with 4.60 stars to #4 with 4.59 stars. Mike Brown vs. Urijah Faber (WEC 41) gets bumped down from #4 with 4.57 stars to #5 with 4.53 stars. Mike Thomas Brown vs. Jose Aldo (WEC 44) enters the rankings at #6 with 4.51 stars. Joachim Hansen vs. Shinya Aoki (Dream 11) drops from #7 with 4.31 stars to #8 with 4.39 stars. Bibiano Fernandes vs. Hiroyuki Takaya (Dream 11) drops from #6 with 4.36 stars to #9 with 4.38 stars. Randy Couture vs. Antonio Rodrigo Nogueira (UFC 102) drops from #8 with 4.27 stars to #10 with 4.35 stars. Scott Smith vs. Benji Radach (Strikeforce: Shamrock) with 4.26 stars. Lyoto Machida vs. Thiago Silva (UFC 94) dropping from 4.27 stars to 4.26 stars. Donald Cerrone vs. Benson Henderson (WEC 43) dropping from 4.47 stars to 4.29 stars.